Did you ever wonder about visiting your favourite hill station without too much travelling involved? When that long weekend is coming up soon and you want to take a trip to the hills without wasting too much time travelling by road. Well, everything is possible in incredible India. All you need to do is explore. Fasten your seat belts to fly to hill stations with airports in India. Set in the backdrop of the Dhauladhar Mountains, Dharamshala is a lovely hill station perched on the slopes of Kangra Valley. Adventure sports, peaceful environment, sumptuous food and Tibetan culture is all that Dharamshala calls for. Apart from the scenic beauty, there are a number of places to visit in Dharamshala too. Nearest Airport: Gaggal Airport or Kangra Airport is the nearest airport and is located 14 kms from the city of Dharamshala. Taxis are easily available at the Gaggal Airport for Dharamshala at nominal prices. You can book a private taxi or choose to pool, the choice is yours. The Queen of Hills, Mussoorie stands at an elevation of 6,580 ft above sea level. With its proximity to Delhi, it is the most frequently visited tourist destination from the capital. Who knew getting here would be so convenient? Nearest Airport: Jolly Grant Airport in Dehradun is the nearest airport to Mussoorie. The approximate distance would be 60 kms, which is nearly a two-and-a-half hour ride. Buses and taxis constantly ply from the city. 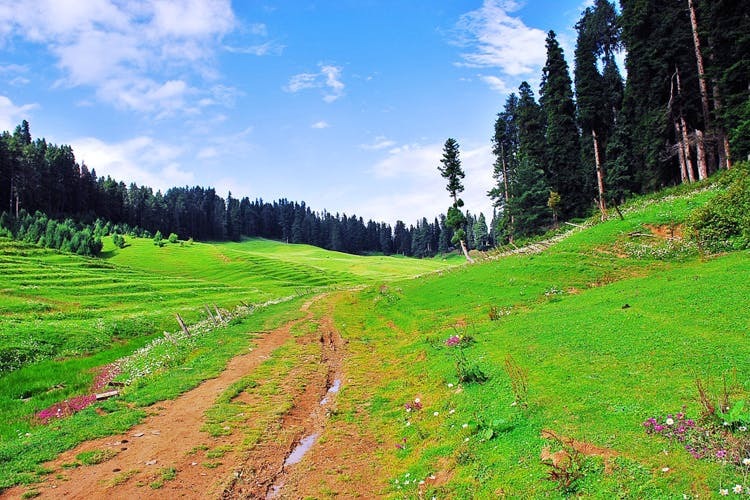 The astonishing beauty of Gulmarg leaves an unbreakable spell upon its visitors. Aptly called as a “Heaven on Earth”, Gulmarg has been blessed with such a beauty that it leaves a soul-stirring experience for the visitors. It’s green golf courses, skiing resorts, Alpather Lake, Ningle Nallah, and Gondola lift are popular tourist attractions. Nearest Airport: Srinagar airport is the nearest airport to Gulmarg, which is just 56 kms away. From here you can easily take a cab to Gulmarg. The journey from the airport takes around two to three hours. Regarded as the ‘Scotland of the East’, due to its distinct similarity to the Scottish highlands, it is one of the most spell-binding hill stations in India. Shillong is famous for its captivating beauty, magnificent waterfalls, historical buildings and hand-woven shawls. The capital of Meghalaya is also home to a tribal community of Khasis. Nearest Airport: Shillong Airport is located at Umroi, which is about 30 kms away from the main city of Shillong. It has good connectivity with many major cities of the country and almost all domestic airlines fly at regular intervals from here. Shimla, the summer capital of British India, boasts of an old world charm and picturesque natural beauty. Winters here are supposed to be more interesting as the temperatures fall drastically. Plus, there’s snow most winter! Plan a 4- day itinerary for Shimla so that you can explore its beauty and local flavours to the hilt. Nearest Airport: Shimla Airport is located in Jubbarhatti, 22 kms from the main city. Taxis are available from the airport to the main town of Shimla and it takes approximately an hour to reach. One place which is flocked by tourists from across the globe, all through the year, Manali is a dream come true for people of all age groups. For all the adventure enthusiasts, you would be glad to know that Manali is also famous for adventure sports like skiing, hiking, mountaineering, paragliding, rafting, trekking, kayaking, and mountain biking. Nearest Airport: The nearest airport is Bhuntar, which is 52 kms south of Manali. A 24-hour bus service is available from the airport. Bus stand is 11.9 kms from the airport and takes 12 minutes to reach. You will also get a regular taxi service from the airport, which takes approximately 90 minutes to reach Manali. Sometimes all you need is a break from the routine life and escape into the serenity of enchanting hills. But with such a busy schedule, it is impossible to spare time for travelling. Thus in order to avoid such difficulties, it is always good to fly to these places and save on your limited time.